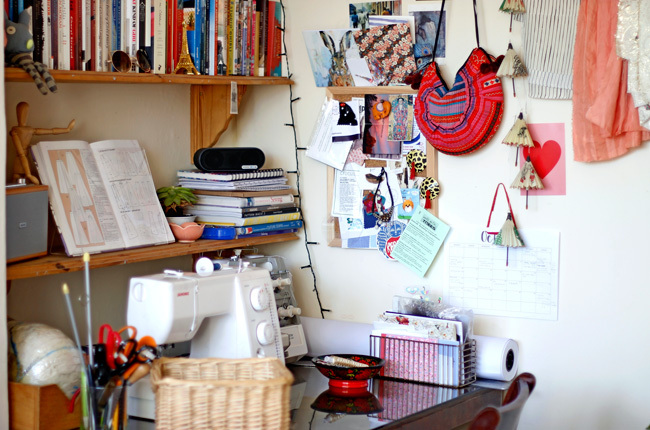 Tilly and the Buttons: Sewing Space Tours... Our Vanessa's Sewing Nook! Hello all! My name is Vanessa. 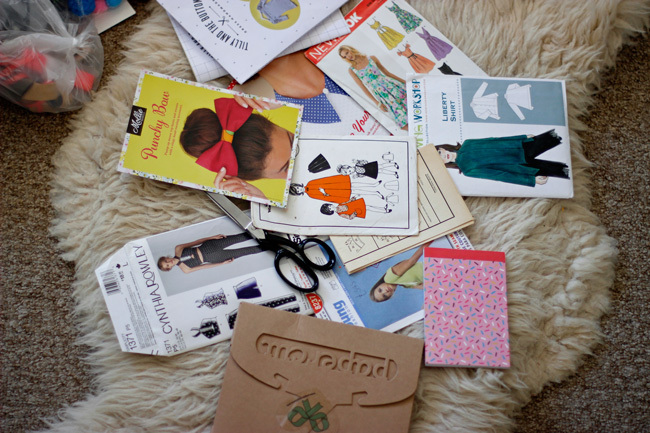 I’m a dressmaker, pattern cutter, and an all-round lover of time consuming DIY hobbies. I've had the pleasure of working at Tilly and the Buttons for the past year and a half helping to make the patterns, sew up gorgeous samples and eating all the studio biscuits. When I'm not sewing for work, I like to take a nice busman's holiday and sew for pleasure – such is the addictive nature of this amazing hobby! 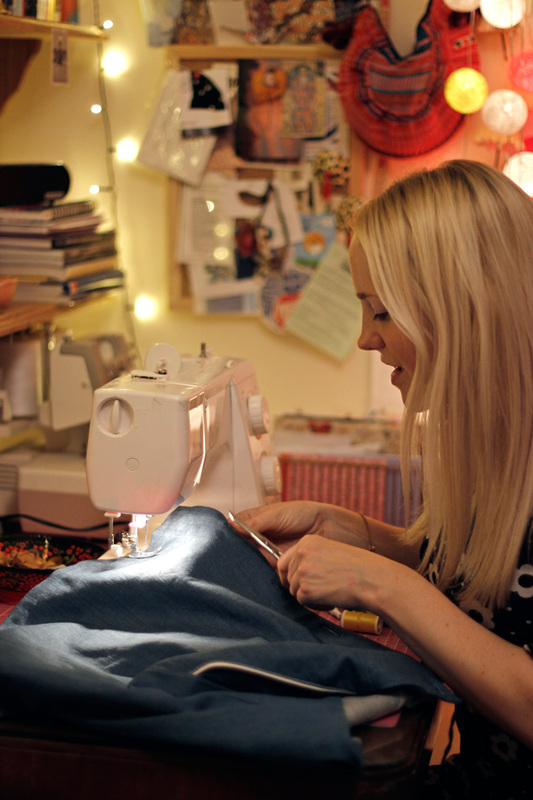 My current sewing space resides in a cosy little corner of my bedroom in South London. 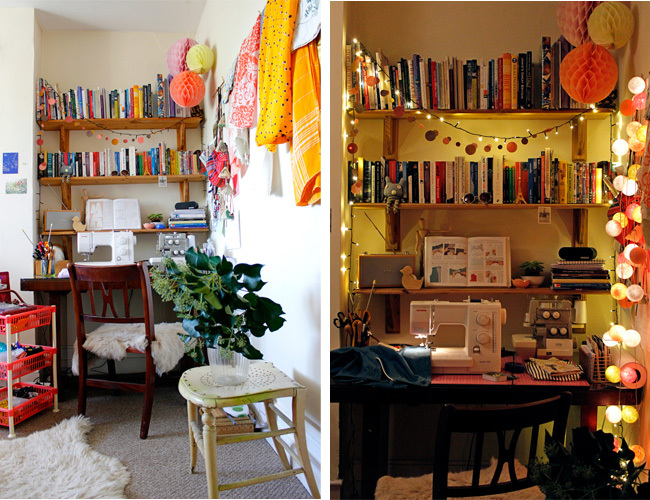 I’ve always enjoyed inhabiting small spaces, and my sewing area is no exception. It’s my haven, with Radio 4 turned down low, copious amounts of tea and snacks, and more fairy lights than Stranger Things. After really getting into minimalism this year, I’ve whittled away a lot of clutter that can make creative spaces feel a bit chaotic. There's a place for everything and (mostly!) everything is in it's place, so it's pretty user friendly. I've tried to get lots of storage in the right places. My most used machines and the cutting mat are always out, as is a big roll of drafting paper ready to roll when I'm pattern cutting. On the shelves in front are sewing books, tools, and a book stand for easy reading. 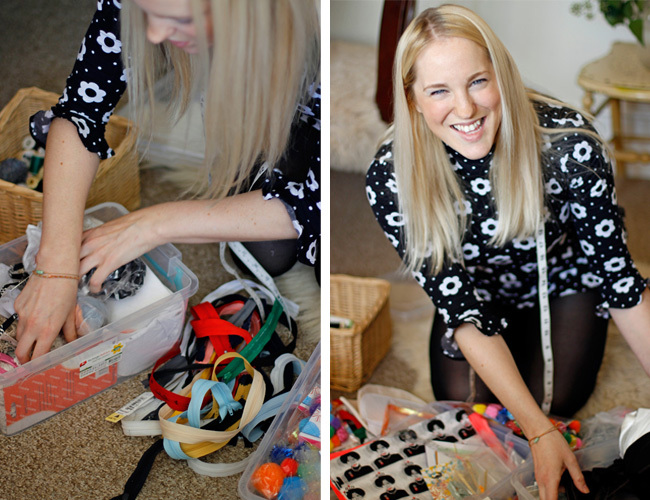 My beloved Pattern Masters and mini ironing boards are stored down to the side, and tucked underneath are lots of storage boxes filled with trims, interfacing, pom-poms, discarded shoulder pads, offcuts…the list goes on! I keep sewing patterns in Manila envelopes with little illustrations on the front. Going through this pile is a joyous cringe down memory lane! 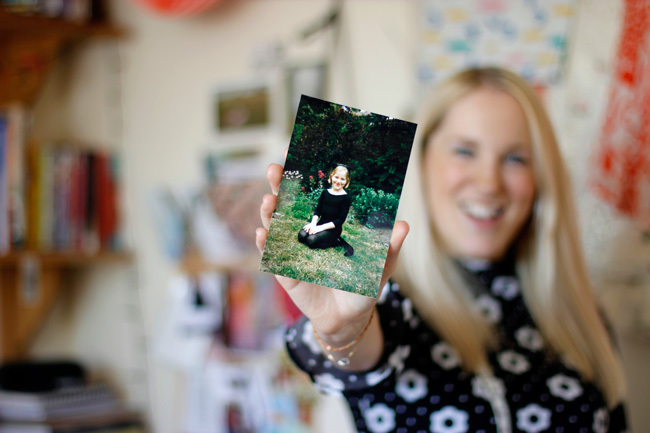 I came to sewing at the tiny little age of 6. My mum was making me a Snow White dress, and with the leftover fabric, I sewed a strip to a rectangle and fashioned a charming, very rudimentary little doll’s wrap skirt. 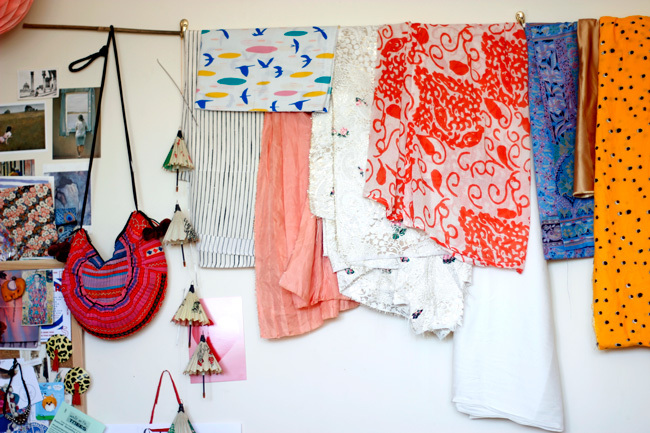 Over the years I graduated from doll's clothes and tie-dye cushion covers (!) 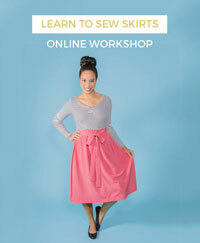 to basic dressmaking patterns. I found them so frustrating and hard to use (sadly, these were the days before Tilly and the Buttons existed!) 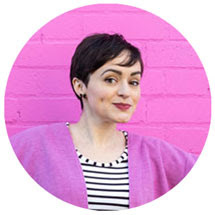 that I realised I'd have to make them from scratch in order to understand them – and the seeds of my future career path and lifelong love of dressmaking were sewn! I later earned my postgraduate qualification in Creative Pattern Cutting at London College of Fashion, and it's one of the best things I ever did. 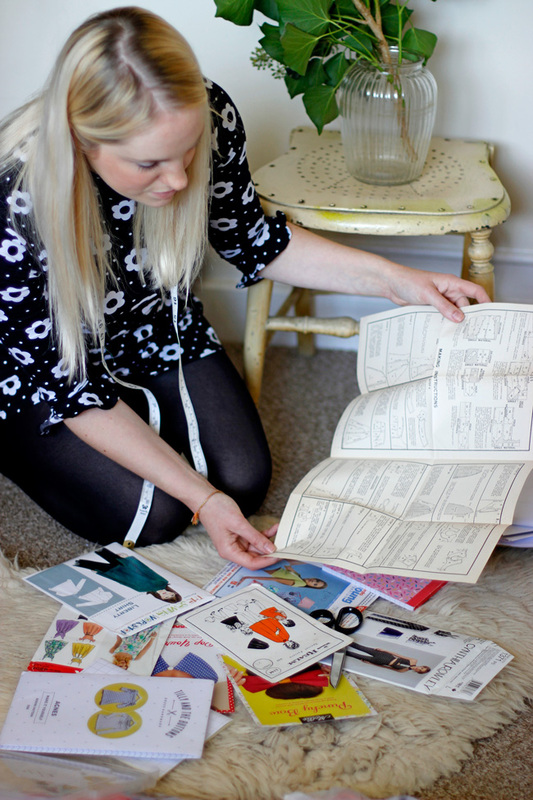 Over the years, I've come to realise that my favourite things to sew and wear are super simple and easy to make. Personal projects need to be a bit mindless! Shift dresses, miniskirts (my all time, forever and ever fave! ), soft shirts and cosy pyjamas. 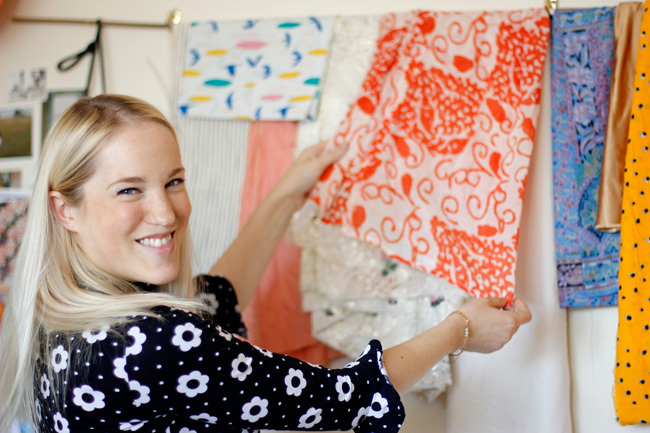 For me it's the fabrics that induce the giddy happiness – bright pastels, polka dots, jazzy prints, fleece backed fuzz - ooh! I have a fabric stash that I justify to nobody and it fills me with endless joy. I keep boxes in my attic with the majority of my collection and a little potter through them always lifts a low mood! I hope other sewists can relate when I express the pangs of guilt I feel when I spot once loved and now abandoned sewing projects ferreted away into a someday/ probably never bag. Mistakes happen and sometimes there I can't muster the patience to sit with an unpicker and get back to square one. In a bid to maintain momentum and keep my sewing mojo bubbling away, I hung some bamboo poles from wall hooks, and can now keep all my an ever changing rotation of favourite fabrics out. Seeing the beautiful textures, patterns, and colours every day keeps me inspired and eager to start another sewing session - and definitely cheers the whole room up! Sewing is the best hobby I've ever come across and I couldn't imagine my life without it. Being able to dream up something lovely to wear and then make it come to life is so satisfying and fun. One unexpected side effect of making my own clothes has been a spaciousness growing around my consumption habits. I don't feel any anxiety to follow fast trends, stay a certain size, or buy lots of cheap stuff made in bad conditions that gets thrown out after a few wears. I know what I like and how to make it to fit - so that's one less thing to worry about! There a few sewing bits and bobs that hold a lot of meaning for me, and I hope to pass onto any crafty offspring I may have in the future. One thing that is particularly special is a big box of buttons we found in my Nanna's flat when it was being cleared out. 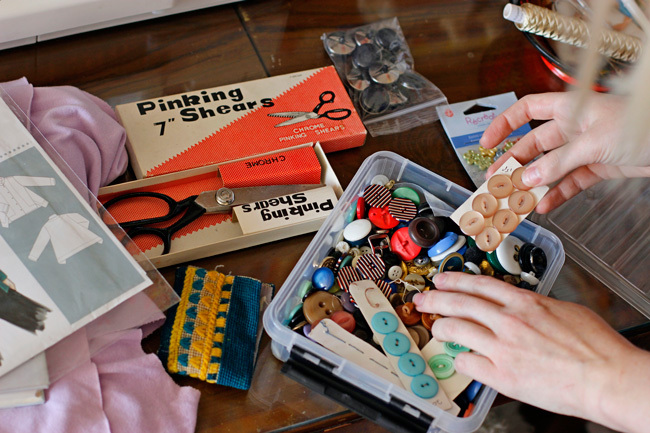 It is full of a beautiful array of colourful, retro buttons that were taken from garments over the years - even ones my Mum remembers from her childhood. It brings me such much joy choosing just the right one for sewing projects, imagining the little lives they've lived and where they'll go next. It keeps me connected in a really nice way to a family member who is sadly no longer with us. I hope you've enjoyed having a peep into my little sewing space. I hope it inspires anyone who'd like to set up a permanent base for themselves, but perhaps only have a little bit of space going spare. 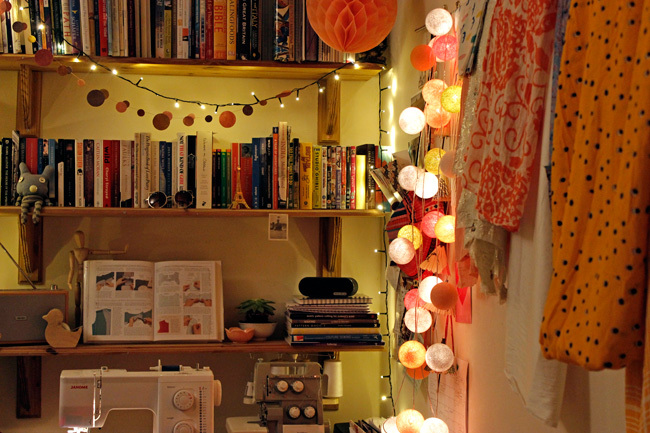 With a bit of storage and plenty of fairy lights - anything is possible! Thank you so much Vanessa for sharing your space with us! It is colourful, creative, and crafty - we love it! Can't get enough? 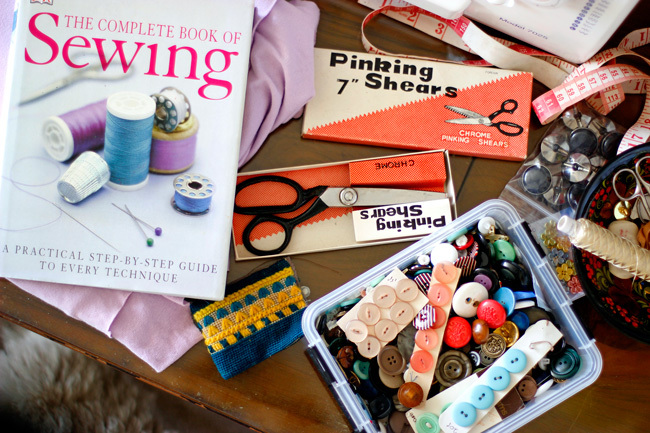 Want further sewing space inspo? Have a peek at some of the places that have been featured. Want to see your place included in the series? Have a look at our submission guidelines. We can't wait to see more of your amazing spaces!